Even singers like to play a karaoke game or two when they get a chance. Nathan Morris and Shawn Stockman of Boyz II Men are no exception. In October 2008 the “Boyz” stopped by the Justin Timberland & Friends Xbox 360 Celebrity Charity Gift Lounge at Planet Hollywood in Las Vegas. 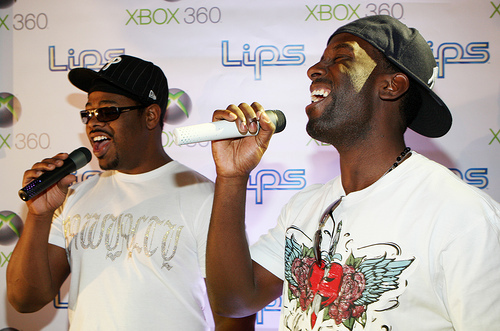 Morris and Stockman performed Stand By Me on the game Lips (exclusively for Xbox 360). The crowd enjoyed the performance and the boys seemed to have a lot of fun performing! Brad Pitt with sons Maddox and Pax. Everyone knows that Brad Pitt loves Angelina Jolie and everyone knows that he also loves his children. But how many people knew that Brad Pitt liked video games? It was reported that Brad Pitt took his sons Maddox and Pax to Las Vegas for a quick boys only weekend where they stayed at the Hard Rock Hotel & Casino. Apparently, Brad couldn’t stand even a short trip without some video game fun and ordered three Nintendo Wii systems to be delivered to their hotel room. Now that’s a devoted celebrity gamer!